Box Hill is one of Victoria’s oldest clubs. Or is it? The origins of many clubs are quite obscure and there is reason to doubt a number of the generally accepted notions about Box Hill. Until I started researching for this column I accepted the Victorian Soccer Federation’s statement that Box Hill was founded in 1922, but I can find no sign of it in the newspapers of that year. The one copy of Soccer News for 1924 in the State Library has no mention of Box Hill. It is possible that friendly and scratch games were being played in 1922 to 1924. Today’s Box Hill United’s website says the club began in 1925 and won Division Four of the Victorian league that year. (Incidentally the Brighton club website also claims that it won Division Four in 1925.) In fact there were two clubs in Box Hill in 1925, Box Hill and Box Hill United. It was the former which won the league and was promoted to Division Three, while United remained in Division Four in 1926. Both teams took part in the Dockerty Cup. So we can safely say that there was league and cup football being played in Box Hill by two teams in 1925, but that is about all. In June 1926 there was a nasty accident when the players of Werribee Soccer Football Club were on their way to meet Box Hill. The truck in which they were travelling was struck by a car at the junction of Flinders and Queen Street and overturned and the players were thrown into the road. We know about this because the truck’s owner sought £40 from the driver of the car for the damage done to his truck and won the court case in September. There is no mention of any recompense for the players! Box Hill went on to win Division Three. The following year there was a split in the organisation of the game in both Victoria and New South Wales. Box Hill joined the Metropolitan Districts, while Box Hill United was part of Section A of the Melbourne and District group. In 1928 Box Hill United became Camberwell City, leaving the Box Hill club as the sole representative of the area. It was as confusing to people at the time as it is to understand today. The split had no sooner been provisionally mended when the Great Depression struck Australia and the game received a serious set-back. When things began to improve slightly in 1931 Box Hill won Division Two of the Victorian League and promotion to the top division, which was not automatic in those days. But this proved a step too far and in 1932 the club finished last in an eight-team league. Box Hill was not relegated however and came sixth in a ten-team league in 1933. The club rose to fourth the next year, but was back in last place in 1935. This time it was relegated. John Punshon has been unable to find a final table for Division Two in 1936 but with four games left Box Hill was safely in mid table. Nobels was the runaway Division Two champion in 1937 and Box Hill led the chasing group, while in 1938 it had dropped back to mid-league mediocrity. The outbreak of war in 1939 may well have had an impact on the Box Hill club which did not win a game in Division Two finishing last. Nineteen-forty was little better with one win, and that was a walk-over, in an incomplete season. There was little continuity among the names on the team sheets that year. Eleven starters and four reserves were named for the away game at South Yarra in July, but the result was nine-nil against. There were only six teams in Division Two in 1941 and Box Hill was in the middle. The club probably gave up trying to compete in the attenuated competition for the rest of the war years, but in 1945 it appeared again in in a league of 13 teams which played each other once, then split into two groups of six who played each other once more. From this rather ordinary performance, Box Hill was about to embark on one of its most successful periods, winning the Division One title for the first and only time in 1948. Led by Don Hutchinson the club won ten out of fourteen games and banged in 45 goals. Hutchinson got 17 of them including three hat-tricks. The Box Hill line-up in 1948 included Vic Warry, Brown, Jack Holborn, Bill Tester, Don Hutchinson, Keith Gravell, Lester Hutchinson, F Mountford, Davis, Bayley, W Chappell, Brown and A McKellar. Until the influx of migrants from Europe the clubs which drew on British and Australian players held sway and Box Hill was in the top five positions in each season until 1952. Thereafter the competition became fiercer and the Hillmen would probably have been relegated in 1958, if the Victorian Amateur Soccer Football Association had not instituted a State League with twelve clubs that year. It only staved off the execution until 1961 when Box Hill dropped into Division One North where it remained until winning what was then Metropolitan Division One in 1968. The reserves won the Armstrong cup in 1960, 1963, 1984 and 1989. For the next few years Box Hill yo-yoed between the State League and the First Division. It was too good for the lower division and not good enough to stay in the top tier. 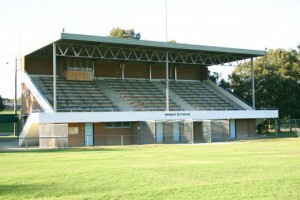 The later part of the 1970s saw Box Hill in Metropolitan Division One until 1982 when it climbed back into the State League before successive relegations saw it drop to State League Two at the end of 1991, when the Victorian Premier League began. That shock led to the club amalgamating with Clayton as Box Hill Inter and a rise to the VPL for the 1995 season. Two years later there was another amalgamation this time involving Bulleen Lions and Brunswick United Juventus, which resulted in two VPL championships in 1998 and 2004 after the combined side finished third in the home and away matches. However, Box Hill gradually disengaged itself from the merger becoming effectively a junior club with Richard Mensink and John Kennedy at the helm in 1999. The demerger was expensive but eventually finalised in 2007. Meanwhile Box Hill fielded a women’s team which took the Victorian Women’s Premier League by storm winning the title six times by 2010. Back to back titles against Heidleberg United in 2009 and 2010 were highlights. 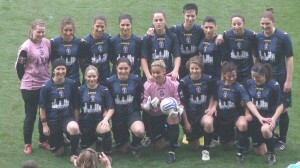 Box Hill women’s team in 2010 before the final against Heidelberg United. Photo: Roy Hay. Many top class players have been involved with Box Hill over the years, as juniors coming through or as senior players and mentors. They include Scott Patterson (and his brother Kyle, who is now head of media at Football Federation Australia), Micky Valentine, Damian Mori, Peter Bedford and Curtis Good. 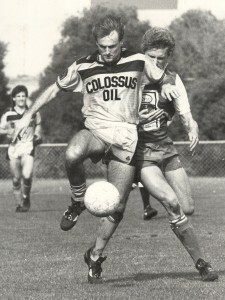 Micky Vaelntine playing for Heidelberg. In 2011 Box Hill was involved in yet another merger, this time with Southern Suburbs. The new entity is known as Box Hill United with the nickname Pythagoras reflecting the Greek influence of what used to be Oakleigh Suburbs in the 1990s. One constant feature of Box Hill football was its stadium at Wembley Park to which it moved in 1958. Source: Wikipedia, Creative Commons. Robert Harrison, Dave Brooks, Zdravko Basic, Andy McMillan, Alan Roodhouse, Darren White, David Azzopardi, Chris Taylor, Andy Hughes, Pedro Ramos, Peter Verechia, Andy Humble. Coach: Keith Webster. John McKinlay, Tom McMorrow, John Dimitrelos, Greg McLeod, Paddy Cooper, Tom Kennedy, A Ham, Mike Hanley, Gary Egan, Stuart McArthur, Gerry McAleer, Alex Christie, Julian Thomas. Coach: John Brown.